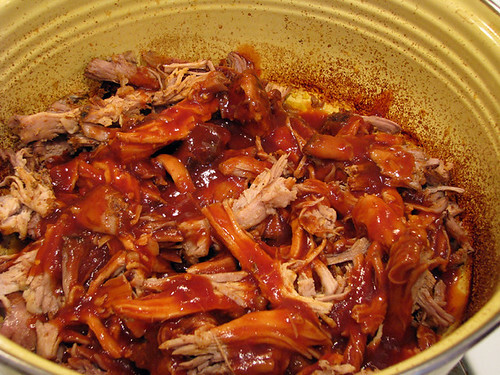 This recipe won Post of the Day for 5/13/10! Seed, devein, and chop the red pepper. Rinse, lightly scrub, and then chop mushrooms. Chop onions and slice avocado. Set aside. Cut leftover chicken into one and two-bite pieces. Both white and dark meat are okay. Set aside. 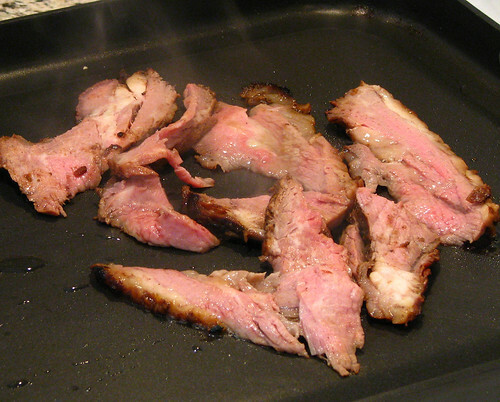 Over a medium-high flame, heat oil on non-stick griddle or in large skillet. Add all veggies and salt & pepper to taste. Since the chicken is already cooked, and you don’t want to end up over-cooking and drying it out, let the veggies cook a bit before adding the chicken. Just before you are going to flip them the first time is usually a good time to do it. While everything is cooking, get your roll ready. Butterfly slice the roll, being careful not to cut all the way through. If it’s super fresh like the one pictured here there’s no need to heat the roll up. 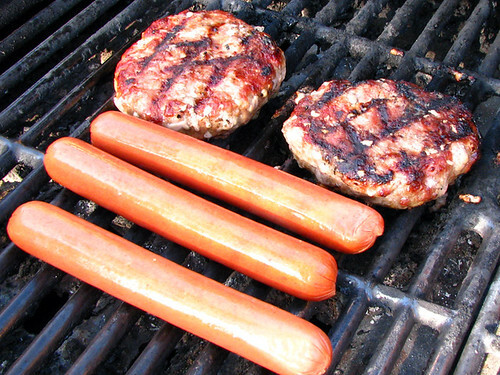 If it could use a little help, place it on the griddle and quickly heat both sides. Evenly spread mayo, place avocado slices on bottom side, and set aside on plate. HINT: Choosing the right roll is critical for a really good cheesesteak sandwich. If possible, skip the pre-packaged rolls in the store and get a good, fresh-baked Amoroso roll, Artisan roll, or French Roll. It does make a huge difference! Just before chicken is ready to come off the grill (you just want to get it hot) add cheese slices. Allow to begin melting before removing from griddle. When ready, remove cheese topped chicken with a spatula and evenly distribute on roll. With the spatula, remove veggies from griddle and evenly distribute on top of chicken. There! You’ve done it!! Enjoy!!! NOTE #2: I was planning on taking a picture of the Cavekids unabashedly stuffing their faces with this dish, but I was too busy stuffing my own face to notice that they were done before I even got halfway through mine. When you’ve got some leftover beef, this is an easy way to make another great meal out of it. NOTE #1: After soaking a Tri-tip in some Teriyamic Marinade for a day, we BBQed for the first time in our new Cave and had the Cave-in-laws as our first guests. Unfortunately, we were too cooked from the unending unpacking to do a photo-shoot for a post, too. But, we had plenty of leftovers and, finally, some time to do one for this! A BIG thank you to the Cavewoman for taking some great shots. 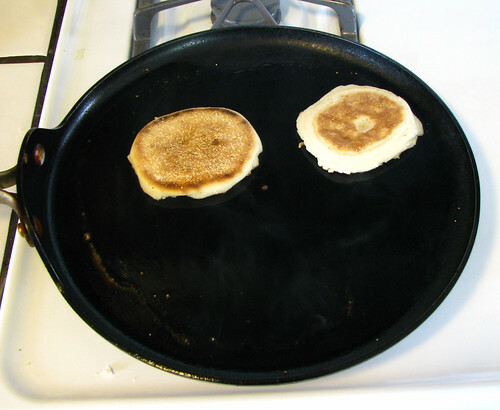 Heat non-stick griddle or large skillet over medium-high heat. 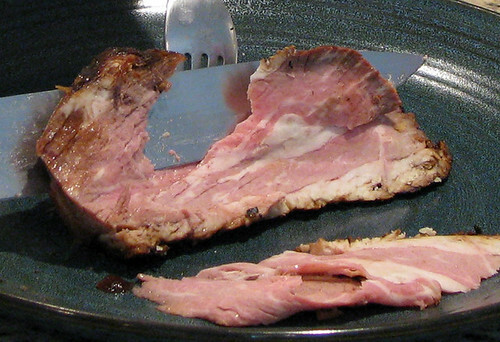 As thinly as possible, slice some leftover steak or other rare to medium-rare beef. Set aside. Slice mushrooms, paper-thin cut the onion, and slice red pepper. Set aside. Butterfly slice the roll, being careful not to cut all the way through. 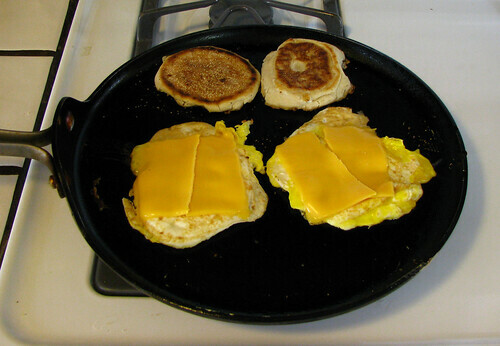 Place onto griddle and quickly heat both sides. Remove from griddle, evenly spread mayo, and set aside on plate. 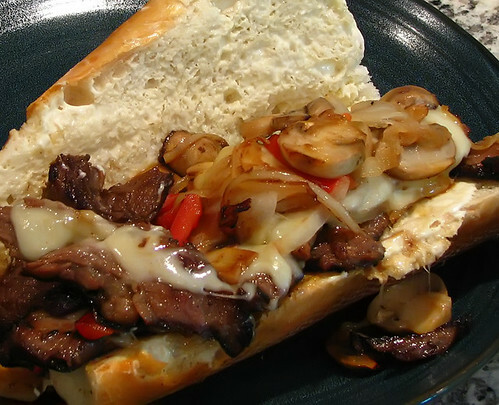 HINT #1: Choosing the right roll is critical for a really good cheesesteak sandwich. 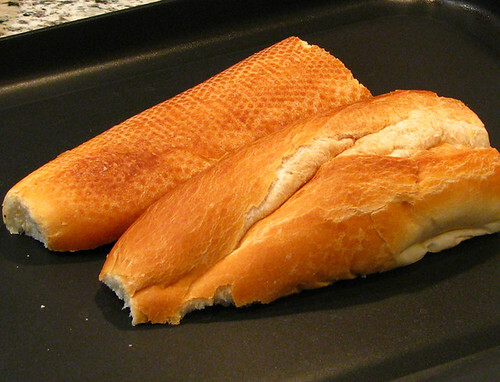 If possible, skip the pre-packaged rolls in the store and get a good, fresh-baked Amoroso roll, Artisan roll, or French Roll. It does make a huge difference! Add oil to griddle. 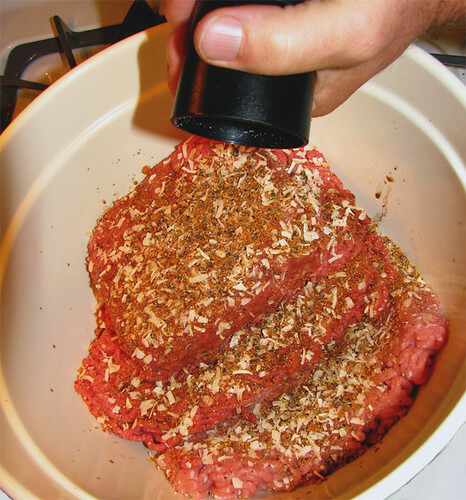 When heated, add meat. Before you are ready to flip the meat, add veggies to skillet/griddle. Keep separated from meat, for now. 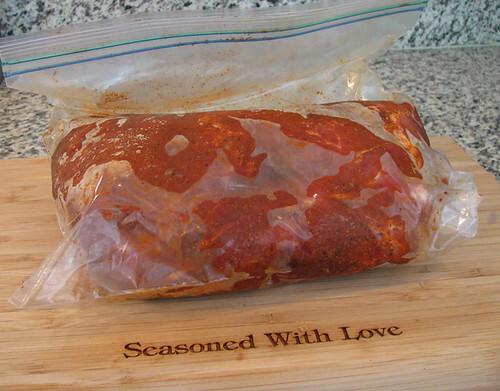 HINT #2: Although I said “Salt & Pepper to taste” in the ingredients, I find that any marinated, or rubbed, meat tends to already have more than enough seasonings for this dish. That said, if you feel the need for more, this is the point to add it. 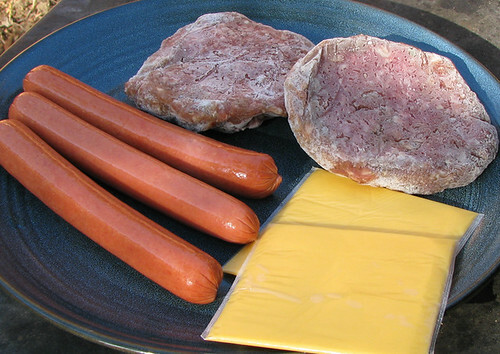 Just before meat and veggies are ready, place cheese on top of the meat. Then, place veggies evenly on top of the cheese, and allow cheese to begin melting before removing from grill. 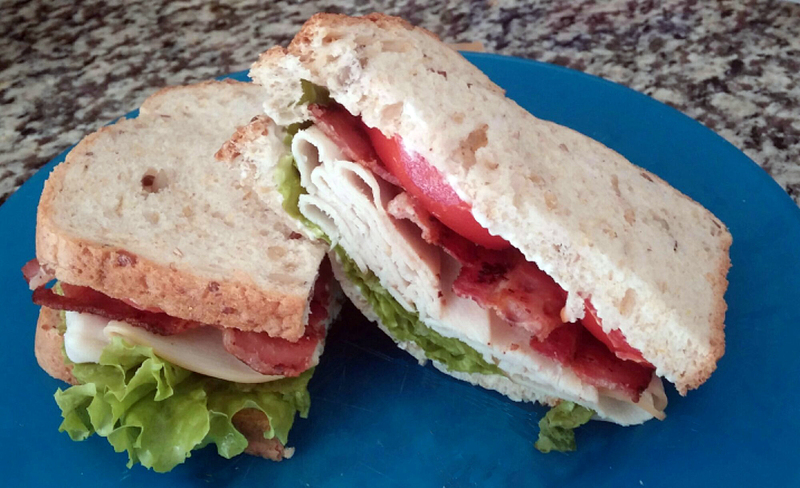 NOTE #2: Usually, I like to use Provolone cheese on this sandwich. In fact, we had just bought some from our local market. But, upon opening, it was readily apparent that it had already turned to the darkside. So, I subbed out some Swiss, which worked fine. Cheddar would have been great, too. Just goes to show that although “cheese” is an integral part of a cheesesteak, the kind of cheese isn’t as consequential … experiment! 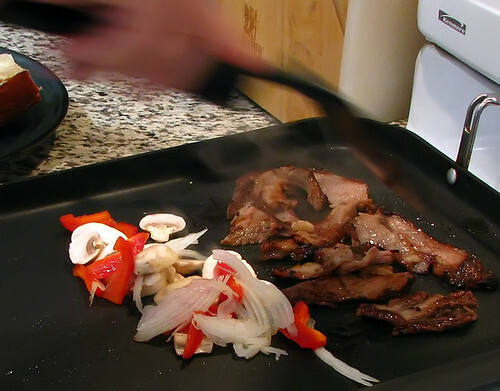 Using a large spatula, remove entire mound of food from griddle and place onto prepared roll. Enjoy! These burgers are so truly “Gnarly” that you have to pronounce the “G” when you say the word! Knead meat mixture and other ingredients together, mixing very well. 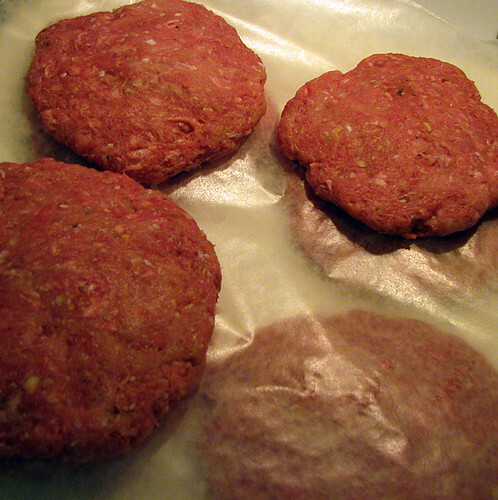 Grab baseball sized handfulls of mixture and form into patties. 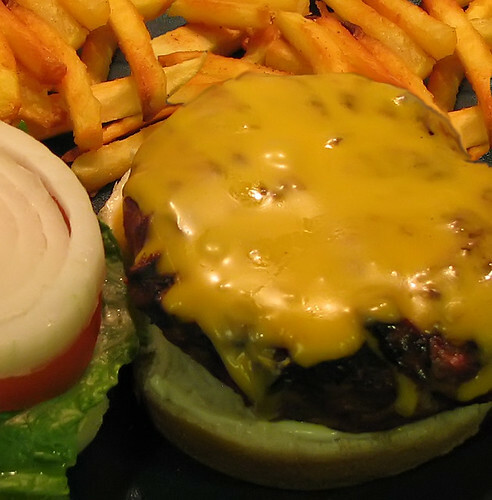 Place patties onto sheets of wax paper. It keeps the burgers from sticking together. 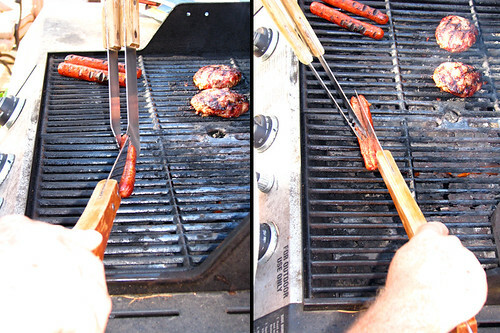 Plus, it makes freezing any leftover burgers a breeze. Just add some cheese, and BBQ or griddle cook as you please. Enjoy! 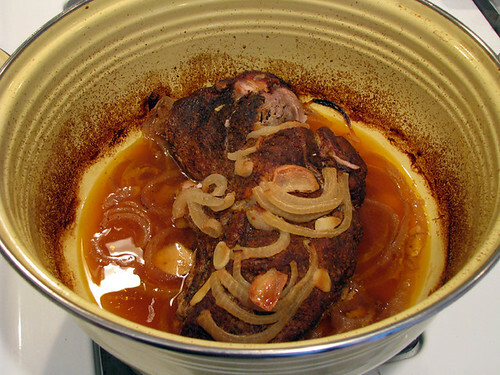 HINT: My Grandfather, who taught me this recipe, used to use ground Veal. I just don’t do the Veal thing, so I substitute the Turkey instead. Ground Pork can be used, too. HINT #2: If you freeze these, just throw them straight onto the grill when you’re ready to chow ’em down – no defrosting necessary. *I highly recommend you get this from World Spice Merchants. 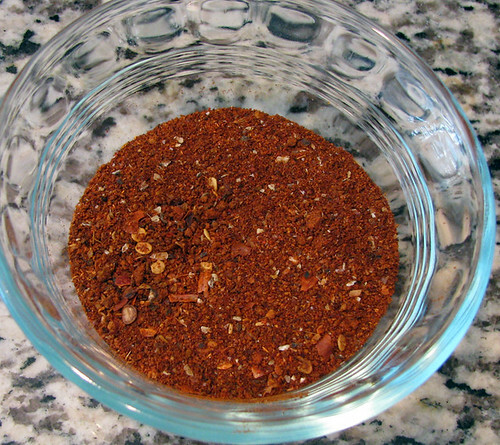 Their version the Montreal seasoning is the best I have ever used. Plus, it has very little salt, especially compared to most of the commercial versions available. Another morning favorite that can be enjoyed any time of day. 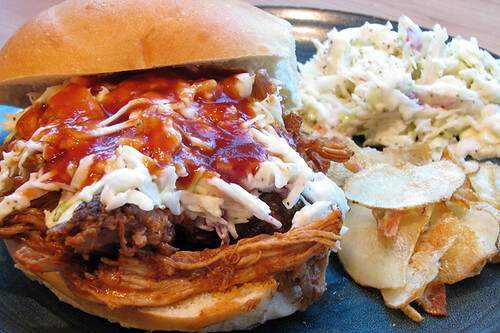 It may not sound good on paper … but, it is Mmmmmmm MMMMMMM good! Fork split English muffin and lightly toast. Though, much like The Egg Thingy, a bagel can easily be substituted. Spread cream cheese and preserves evenly over both muffin halves. In this case, I used some homemade White Peach Jam made by CampViola (OMG! That stuff is phenomenal). 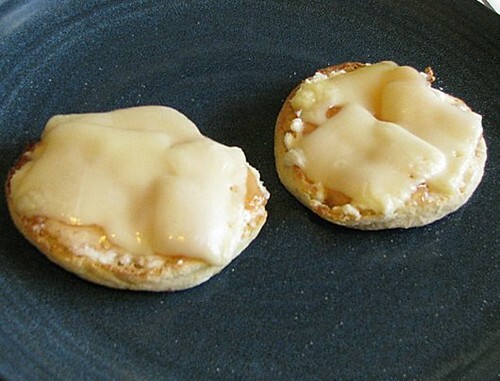 Add a slice of Swiss cheese to each half and place on small cookie sheet or shallow bake pan and place in toaster oven. 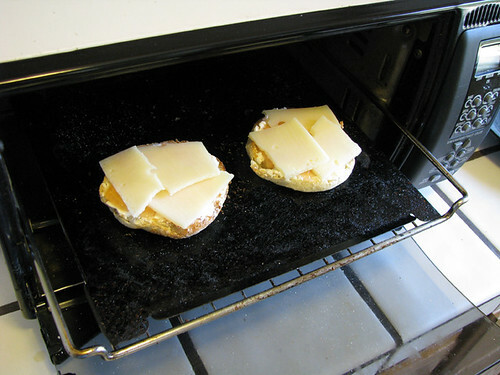 If you don’t have a toaster oven, just put them under the oven broiler, on low. HINT: Be sure that cheese doesn’t hang too far over edges of muffin or you will leave more cheese on the baking sheet than the intended target. Either “toast” or “top brown” until cheese is melted. 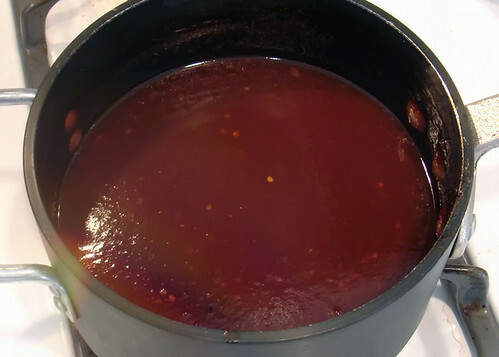 HINT #2: Let stand a couple of minutes before eating – the preserves get quite hot. It may not seem like all these things would go together … but, man do they ever! HINT #3: If you’re afraid that this thing will be “The Angioplasty Special”, try using low-fat cream cheese and swiss cheese made from 2% milk. It will still be incredible. A quick and easy open-faced breakfast sandwich to get you out of the cave on the right foot. In a large skillet or griddle, melt butter on medium-high flame. 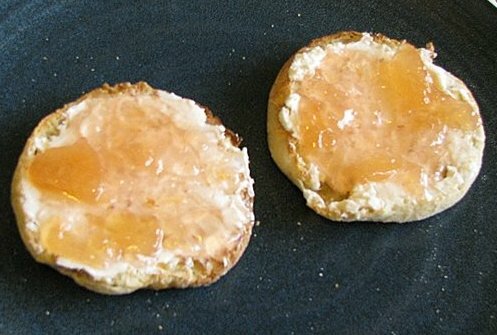 When completely melted, take muffin or bagel slices (it’s great with either!) and place onto skillet face down, moving around them around to evenly absorb most of the butter. 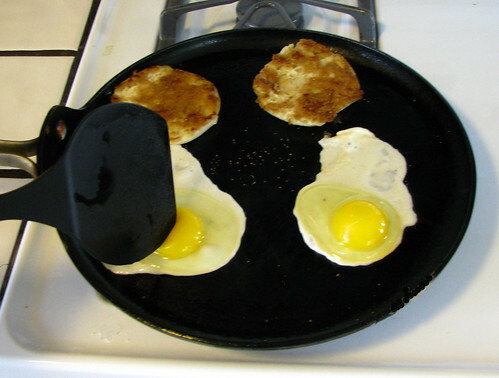 When browned to taste, flip muffin/bagel over and crack eggs into skillet. 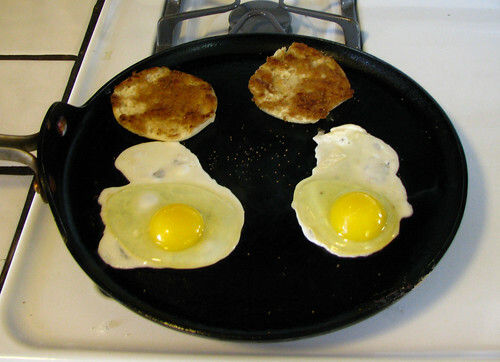 HINT: Pour eggs from shell very slowly onto skillet to minimize running. Before yolks start to harden, take spatula and break open yolks. This is the key: Be sure to spread broken yolk over much of the hardening egg whites. 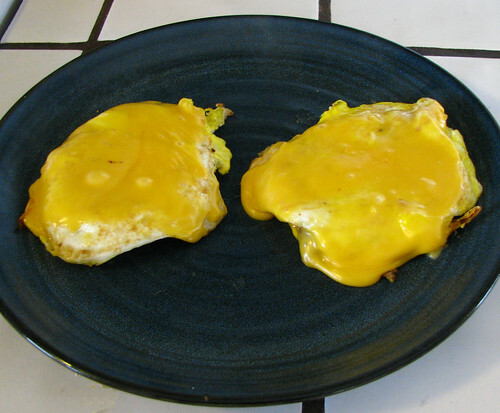 When eggs have sufficiently cooked on the first side, flip over and add a slice of cheese to each egg. 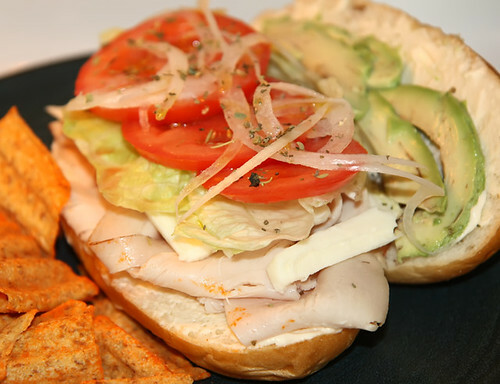 HINT #2: I have tried Swiss, Cheddar, and Mozzarella … all to great reviews. But, the overwhelming consensus is that plain old American individual slices are the best. 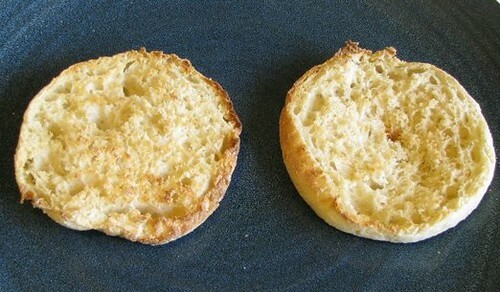 At this point, remove muffin/bagel slices and place onto plate. Take a domed lid (I use the lid from my steamer) and cover eggs. Turn off stove and let stand until cheese melts (20-30 seconds usually). 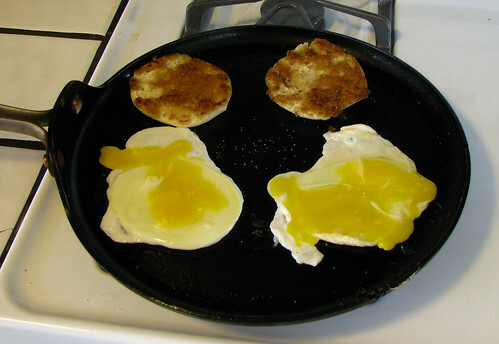 Remove eggs from skillet and place onto muffin/bagels slices. Enjoy as is or add your favorite hot sauce. Yes … the muffins are under there! Want to be a real caveman? 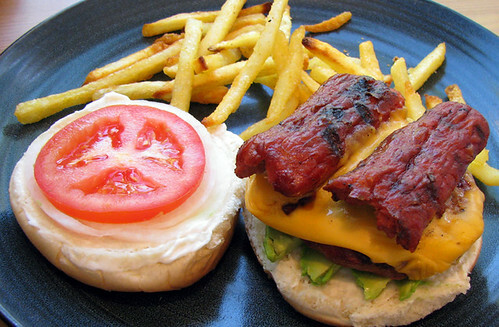 Grill up a couple of sausage patties or bacon slices and place them between the muffin/bagel and the egg.